Brian Duensing was even worse in relief. 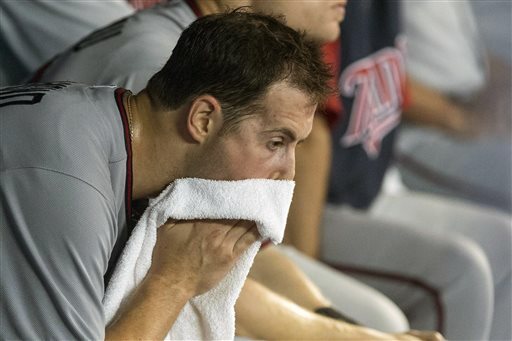 Morneau, Pelfrey and Duensing are three veterans on expiring contracts. The Twins might be interested in retaining any of the three for 2014, but they might not — and there doesn't appear to be a great deal of demand for any of them. That Pelfrey merely made his scheduled start suggests that he's unlikely to be moved. If a Pelfrey trade were truly in the works, the Twins would probably have used the offday to work around him, thus saving a start for the team trading for him. The big right-hander is the one of the three who would most fit the 2014 Twins, and Tueday's clunker aside, he's been pretty good since coming off the disabled list this month (2.28 ERA in his four previous starts). Plus he's said for public consumption that he'd like to stay here. But he also has Scott Boras as his agent, and Boras seldom skips an opportunity to take his clients into free agency and into the arms of the highest bidder. "Winning" a bidding war for a non-star is akin to losing. So it would make sense for the Twins to trade Pelfrey now. Of course, that requires a trading partner. That may not exist at the moment. Waiver-wire deals next month — akin to the move that brought Carl Pavano to the Twins in 2009 — are more likely than straight forward trades today for the Twins. And now that I've said that, watch the Twins make some deals this afternoon, which would serve to illustrate how little I know. This is the kind of thing that happens when a farm system is loaded with talent that is truly developing: The Twins minor league affiliates— at least the full-season ones — are sporting some impressive records in 2013. Triple A: The Rochester Red Wings (60-51) won Monday and are now in first place in the North Division of the International League. It's the weakest of the three first-place records, but the Wings are certainly surging — 19-7 in July, and they were 11 games out of first place on July 2. Double A: The New Britain RockCats (49-59) are the exception to this brag. They were off Monday. On Sunday they broke a long losing streak that included the controversial Miguel Sano homer run pimping and benching. High A: The Fort Myers Miracle (65-38 for the full season, 20-16 in the second half) beat former Twins pitcher Scott Baker 5-0 on Monday. (Baker's on a rehab assignment; I think it's safe to say his return from Tommy John surgery has not gone as well as he or the Cubs had hoped). Miracle manager Doug Mientkiewicz earlier this season compared his squad (which at the time included Sano and Eddie Rosario) to a Ferrari; now he has Byron Buxton on his team, and the consensus top prospect in baseball was just named player of the week in the Florida State League. Low A: The Cedar Rapids Kernels (65-39 for full season, 25-11 in second half) have a reshuffled roster from the team I saw play back in May. No Buxton, no D.J. Hicks, no J.D Williams now — but the Kernels,who finished second in their division in the first half, now have the best overall record in the Midwest League. I expect to see them again next week, and I'll (of course) file reports. Rookie: The Elizabethton Twins (18-19 after a loss Monday) generally dominate the Appalachian League, partly because they tend to have older players than many of their rivals. (While every franchise has one Triple A, Double A, high A and low A affiliate, there are diverse setups in the lower levels between the short-season A leagues, the rookie leagues and the complex leagues. 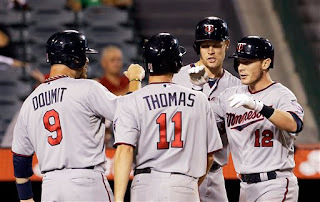 The Twins have no short-season A team.) In that context, records and stats lose much of their meaning, but it's safe to say that this is not one of the better collections of talent the Twins have had in E-town. Complex: If the numbers generated by games in the Appy League mean little, multiply that for the Gulf Coast League, an assemblage of players just entering professional ball leavened with established major-leaguers beginning rehab assignments. The GCL Twins — who have had both Nick Blackburn and Kohl Stewart pitch for them — are 15-17.
outfielding error of the season on this line drive. The July 31 nonwaiver trade deadline is fast approaching, and the Twins, obviously, will be in "seller" mode. 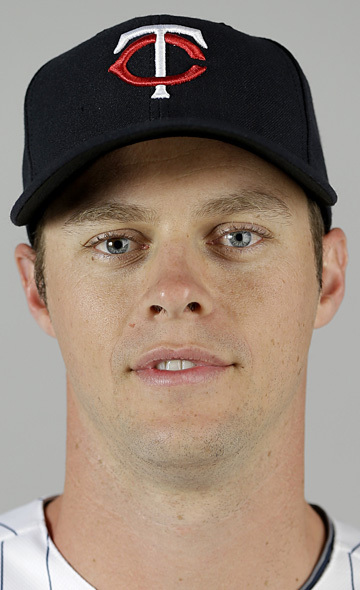 There is a general anticipation that the Twins will trade Justin Morneau this week. I wonder if there wouldn't be more value in trading Ryan Doumit, or at least more interest on the part of other teams in Doumit. Morneau is a first baseman who can also DH. Doumit is properly thought of as a DH who can be used at catcher or a corner outfield. Morneau is a free agent after the season; Doumit has a year left on his contract at $3.5 million. Both are more valuable for their hitting than for their defense, and neither is hitting all that well; Doumit is having the worst offensive season of his career.And the midseason trade market for hitters is frequently softer than for pitchers, although the possibility that some significant hitters for playoff contenders (notably Nelson Cruz of Texas) are about to be suspended may raise the demand. 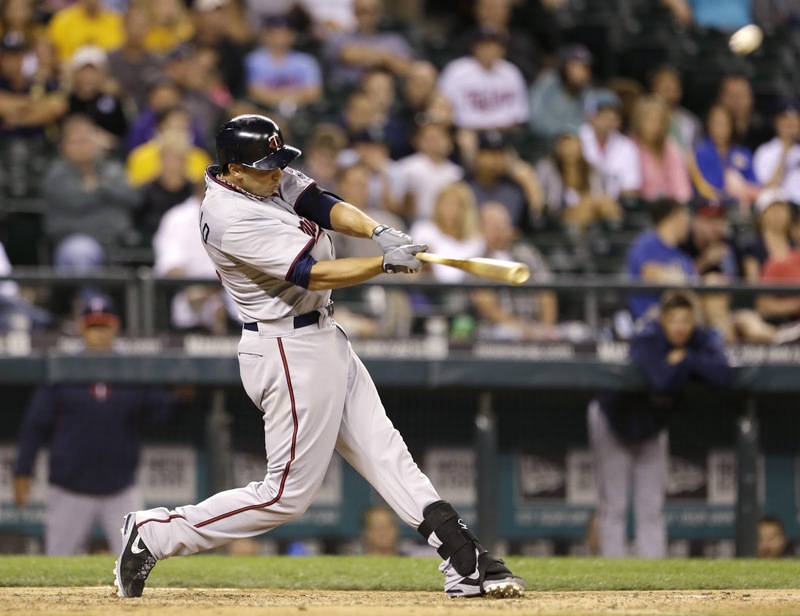 The Twins do have the catcher/outfielder to take Doumit's roster role in Chris Herrmann. The two have been splitting right field and catching chores during Joe Mauer's paternity leave; trading Doumit would probably require bringing back one of the Oswaldo Arcia-Chris Parmelee duo shipped out to the minors just before the All-Star break, and I'm not sure the Twins are eager to do that. But the key issue, again, is what kind of return the Twins could get. And I suspect it's more likely the Twins would get enough to move Doumit. a game at Miller Park. Fifteen years ago, when Sammy Sosa and Mark McGwire were pumping up in private and pursuing home run records in public, steroids were a quiet gray area. Technically they were a violation of the rules, but nobody — owners, players, media — was interested in enforcing the rule. Baseball's ethos — from spitballs to cutting the bases — has always held that cheating is fine as long as you don't get caught. In that environment, nobody should be surprised that performance-enhancing drugs became widespread. Today, however, is a markedly different environment. There is testing. There is a vocal outcry from the bulk of the players to get the PEDs out of the game. We have gone, in a generation of players, from an implicit expectation that a player seeking to be better would use to an explicit contempt for users. It is more understandable to me that a Barry Bonds would use steroids than that Braun would, just because of the time and place for each. top of the 13th inning Friday night. A couple of good games from a couple of guys who really needed something to go right for them. Minor league slugger Chris Colabello -- a mere 5-for-37 in his brief major league career, all singles, entering the game -- hammered a two-run homer in the top of the 13th for the decisive runs. 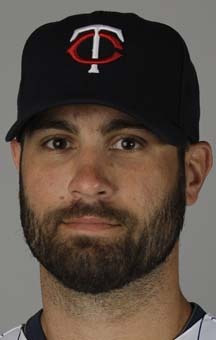 And Scott Diamond, who came into the game with a 5.53 ERA, gave the Twins six innings of one-run ball. Ron Gardenhire had indicated in a radio interview earlier in the day that Diamond was running out of chances, but the lefty kept the Twins in the game. Still, it's not difficult to spot the flaws in Diamond's outing. He faced 27 hitters and threw a first-pitch strike to exactly a third of them. He threw 57 strikes and 44 balls, not exactly a prime ratio. And he had just one strikeout in his six innings. The big picture results were good for Diamond. The process, however, was not. 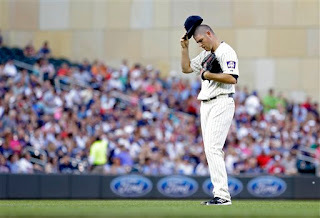 Much of the pregame chatter on the Interwebs was about the Twins announcement that Joe Mauer, whose paternity leave expires today, would not report to the Twins in Seattle this weekend but will rejoin the squad on Tuesday when they start a home series against Kansas City. I don't have a problem with this. Yes, the Twins are a better team with Mauer playing. But no one game, or two games, is going to make or break their season. They're obviously not making the playoffs. The Mauer twins were born about five weeks premature, and if it's worth it to him to forfeit a quarter of a million dollars in salary (pro-rated, his salary is a bit more than $125,000 a day) to spend today and Sunday with his wife and daughters, who am I to argue? His absence gives Chris Herrmann a couple more days to get at-bats. I don't regard that as a terrible thing in the long haul. inning. Correia didn't get through the inning. Kevin Correia gave up six runs in the second inning Thursday night; he faced 13 batters, eight of whom reached base, four of them with extra base hits. Not a good start by any standard. Correia ended April with an 2.33 ERA; it's now 4.56 and rising. His ERA since the start of May is 5.60. I had hoped that he'd be pitching well enough to draw some trade interest this month; I can't imagine that happening. being hit by a pitch in the ninth inning. Before I get into the bizarre ninth inning of Wednesday's Twins game, let me say that the game was NOT decided by the one at-bat. The Twins lost that game because they mustered exactly as many hits Wednesday as Maddie Mauer had babies. Teams have been known to win while being two-hit, but it's not done often or easily. That said: I told my wife upon seeing the umpiring crew at the start of Monday's game that it was a bad crew. Mike Muchlinski and Alfonso Marquez? One of them is a bad sign; the both of them is practically a guarantee of a screw-up. This is probably the kind of low-grade crew a series pitting a pair of sub-.500 clubs should expect to see as the season dwindles, but it doesn't make the crew's inability to get the infield fly rule right any more palatable. OK, the ninth inning. The Angels of Anaheim have a 1-0 lead and Ernesto Frieri, the closer the Twins had lit up for five runs less than 20 hours earlier, on the hill. Frieri opens the frame by walking Clete Thomas. Doug Bernier fouls off two bunt attempts; Frieri then hits him with the 0-2 pitch. Two on, no outs, Justin Morneau up. Frieri opens with ball one. So ... a walk, a HBP, an immediate ball one. One might well conclude that any hitter should at this point be taking the next pitch. Let Frieri continue to beat himself. But it's Morneau, the former MVP, in a lineup of castoffs and unprovens. He's the best shot at getting the big hit. So his thought process at this point should be: This is practically a 3-0 count. Look for a fastball that's in just the right place. Zone in on that and take anything else. If Morneau swings at the 1-0 pitch, he should hit a rocket. Morneau swings at the 1-0 pitch and, instead of a rocket, hits a 60-foot pop-up. The umpires lack the wits to invoke the infield fly rule — crew chief Ted Barrett misquotes the rule after the game, saying Frieri had to be camped under it to make the call, which is NOT what the rulebook says — and the Angels turn it into a double play with Bernier hung out to dry. If he takes off for second, Frieri catches the pop-up and doubles him off first; Bernier instead clings to first, Frieri lets the ball drop, throws Morneau out and gets Bernier in the rundown. The umps blew the call. Morneau blew the at-bat. the rookie catcher's 10th inning grand slam. More proof, if any was needed, that you really can't figure baseball. Chris Herrmann only caught Tuesday night because Joe Mauer was on his way back to the Twin Cities because his wife went into labor with their twins. And in the 10th inning Herrmann busted the game open with a grand slam. For the game, Herrmann was 3-for-5. In his extremely limited major league playing time this season, Herrmann is hitting .409/.458/.727. 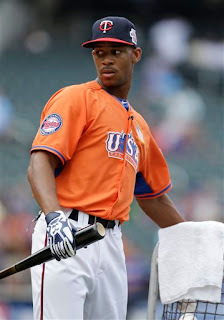 In Triple A, he was hitting .227/.297/.312. The word via Twitter from the beat writers was that Drew Butera was to get the paternity leave callup. Presumably Ryan Doumit will be anchored in right field (anchored is the ideal verb to describe Doumit as an outfielder). 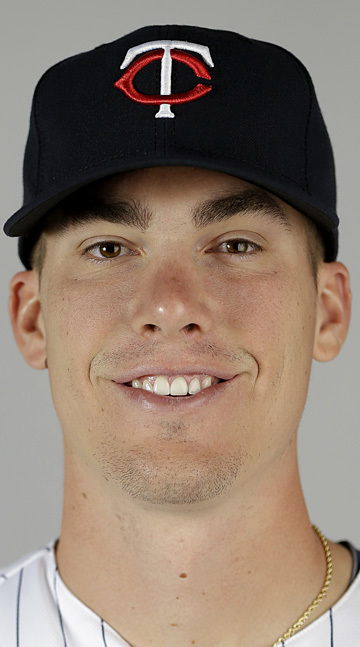 I harbor no illusions that Herrmann is a .300 hitter, much less a .700 slugger, but I sure hope he gets most of the time behind the dish in Mauer's absence. wound up scoring twice in the frame. On his pregame radio show Monday, Ron Gardenhire twice described Angels starter Joe Blanton as "a contact guy." This was in explaining why minor-league veteran Doug Bernier was in the lineup instead of Jamey Carroll. Joe Blanton is having a lousy year, and it didn't get any better Monday; the Twins knocked him out in the fourth inning and drove his ERA up to 5.66. I have to admit, I'm baffled by how horrible Blanton's season has been. He has a league average strikeout rate; he has a very low walk rate. On Monday, he walked two in 3.6 innings, but one of those was intentional, and he struck out four. He has 3.35 strikeouts for each walk on the season, and it's almost impossible to have that good a ratio and still have bad results. But Blanton is doing just that. One problem, obviously, is the long ball -- Blanton served up his 24th gopher ball Monday night. Another, if Monday night is any indication, is the sloppy defense behind him. The play shown in the photo above, for example; if the Angels had turned that double play, Blanton gets out of the inning unscathed. Instead, the inning was extended, and the Twins scored twice. Jim Pohlad, one of Carl Pohlad's sons, in 2010. There is significant money involved: the Pohlad estate puts the value of the stake at $24 million, the IRS says it's $293 million, and that difference equates to $121 million in estate taxes. It's enough to give me reason to be happy I'm not a billionaire. For both Forbes and the Strib, this is a business story, one that illustrates the techniques and complexities of estate planning — not merely tax avoidance but shifting control of enterprises from one generation to the next. But as a baseball fan, I was struck by the notion that the dispute hinges in large part on who controlled the business. The Pohlad sons, executors of their father's estate, say that while Carl Pohlad still held most of the stock in the entities that make up the ownership of the franchise, it was non-voting stock; the sons already had all of the voting stock and thus operational control of the Twins. Legalities are one thing; reality can be something completely different. I reviewed, off the top of my head, the Twins history over the final 15 years or so of Carl Pohlad's life, looking for what I consider "ownership level" decisions and asking myself: Who was in control when this decision was made. This may not be an exhaustive list. What constitutes an ownership level decision differs from one operation to another. Charles O. Finley, owner of the A's in the 1960s and '70s, was known to dictate starting lineups to his managers. That's one extreme. 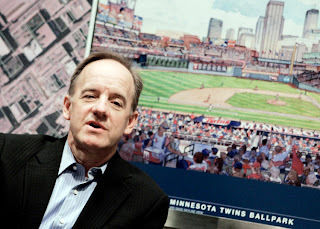 My take on the history of Pohlad ownership is that Carl (and his sons) have limited their involvement in the operation to the biggest of the big picture decisions: Selecting their upper management, setting budgets, pursuing the new ballpark. Keeping Tom Kelly: With the Twins in the doldrums in the late 1990s, Chris Clouser was briefly brought on board as CEO. He didn't last long, and the apparent breaking point came when he pushed to have manager Tom Kelly fired in 1997. The resulting power struggle between Clouser and the basebal people had to be resolved by the owner. Carl Pohlad opted to keep Kelly, and Clouser left. Purging Pat Meares: The 1998 season didn't go well on any level for the Twins — 70-92 with a roster crammed with aging bounce-around veterans. General manager Terry Ryan was assigned a bare-bones budget that effectively put an end to the era of playing for .500 (and missing the mark). Just before the winter meetings, Ryan nontendered starting shortstop Pat Meares. In retrospect, this was the single biggest step in the revival of the Twins in the 2000s. The pinch-penny approach forced Kelly and Ryan to rely on such unprovens as Corey Koskie, Cristian Guzman and Torii Hunter, rather than the Otis Nixons and Mike Morgans who populated the 2008 roster. It was a good financial move; it was also the wisest baseball move. And by all accounts, that decision was pushed not by Carl Pohlad, but by the next generation. This episode points to a changing of the guard. Contraction: It's now 2001. The Twins are showing some signs of life on the field, but they're still stuck in the Metrodome with no progress on getting a more lucrative facility. When somebody in MLB comes up with the idea of shutting down two franchises (one of them being the essentially ownerless Montreal Expos), the Twins offer themselves as the other team to be sacrificed. Nothing in Carl Pohlad's biography opens him up to as much scorn as this episode. I don't really know how much of the blame truly belongs to him, or to what extent the sons also favored contraction. Certainly, however, the elder Pohlad was the public face of the decision, and he owned it. The assumption here is that he was still in control at that point. The Ryan retirement: Near the end of the 2007 season, Terry Ryan stepped down as general manager, citing burnout. Jim Pohlad presided over the press conference at which the reshaped front office was announced. Carl Pohlad was also there, but in the audience. By this time, the son was clearly in charge. 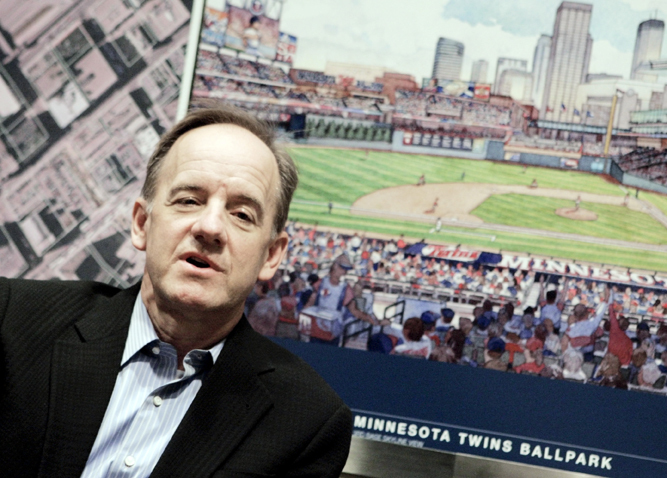 Carl Pohlad died in January 2009, so the obvious ownership-level decisions since then — the Joe Mauer contract, the contracting payroll since 2011, the firing of Bill Smith and the return of Ryan — obviously belong to Jim Pohlad and his brothers. Friday as Glen Perkins zipped himself back up on the mound. 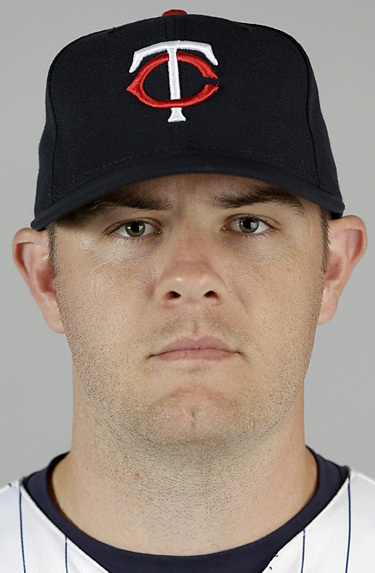 It was quite the week for Glen Perkins: His first All-Star team (may there be more), even if he didn't pitch; then, on Friday, he realized after getting the first two outs that his fly was undone; then, on Saturday, after converting his second save in as many nights, the Cleveland Indians twitter feed called him Scott Perkins. But that the Indians have such regard for him that they don't know his name ... that probably stung a bit. for the first out of the ninth inning Friday. Pedro Florimon certainly had a good game Friday: Three more-or-less spectacular plays in the field, two runs scored (with a hit and a walk) on offense. His play yielded this Trevor Plouffe line about Florimon's defense: "I never realized how bad I was at shortstop until I watched someone like him." Florimon's season has basically lived up to his good-field, no-hit reputation (although he's committed a few too many errors). In reality, his hitting stats have been wrecked by an extreme platoon split: Against righties, the switch hitter is .274/.342./.402, which is plenty good enough for a shortstop. But against lefties, he's a dismal .123/.161/.153, which is pitcher-like. It's not a lot of at-bats, and it's rather inexplicable for a natural right-handed hitter to be that much better from the left side. It would seem likely that Florimon is better right-handed than that — and, by the same token, quite possible that he's not really that good left-handed. But it occurs to me that, of the nine players in the Twins batting order Friday night, Florimon is one of the few who has a chance to be in the same position on the next good Twins team. There's Mauer at catcher, maybe Florimon at short. Everybody else will probably either be gone or playing another position when the big wave of minor league talent takes hold. Byron Buxton, the consensus top prospect in the minors. The games resume today! The games resume today! Prospect rankings: A couple of notable prospect watchers delivered their revised mid-season top prospects lists Thursday. Keith Law of ESPN put Bryon Buxton No.1 and Miguel Sano No. 4. Law also ranked new first-round pick Kohl Stewart No. 30, Alex Meyer 38 and Eddie Rosario 41. Law's midseason list goes to 50, so the Twins represent 10 percent of it. Law, unlike Baseball America (whose midseason list I discussed here), included new draftees in this ranking. Stewart has barely pitched in pro ball (three games and eight innings in the GCL), so ranking him ahead of Meyer seems a bit aggressive, but we know he's talented. John Sickels' list goes to 75, and, like Baseball America, doesn't include the 2013 draft class. He puts Buxton No. 1 and Sano No. 3 (mirroring BA's ranking to that extent at least). He has Meyer at 51 and Rosario at 56. Tonkin back in minors: A week ago I speculated on ways the Twins could make room for relief prospect Michael Tonkin. They didn't bother; when Caleb Thielbar came off the bereavement list, Tonkin was returned to Rochester. He'll be back. I understand the reluctance to (potentially) prematurely drop one of the current pitchers; I'm also quite certain that Tonkin is going to be a significant bullpen arm in the near future, and I suspect he'd be an immediate improvement over Josh Roenicke. A quick preliminary note: I now contribute an editorial this week to The Free Press' opinion page. What follows is this week's offering, which published today. I'm making it do double duty because (a) it's an appropriate topic for the blog and (b) I can use a light stretch in blog duty these days. And I explain all this to forestall any suspicion of plagiarism. All-star games, by their nature, are about spectacle and celebration more than competition. They are, at least in theory, the best players showing off their skills. 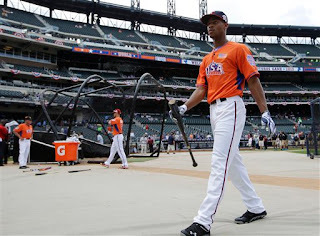 Tuesday night's baseball All-Star Game gave us its usual subtle reminders of how it differs from its counterparts in our other major sports — not least of which is that baseball's is played in midsummer, while the others come in the dead of winter. In the all-star games of the NFL, NBA and NHL, defense is an afterthought, making the "contest" a higher-scoring imitation of a real game (or, in the case of the NFL Pro Bowl, a mockery of the sport). On Tuesday night, the American League held the National League's hitters to three hits, and the score was a baseball-like 3-0. The difference might come down to this: The other games are played to a clock. Baseball is played to defense. Outs are baseball's unit of time. The game is its own timepiece. Not that the All-Star Game today is laden with competitive fire or the subject of intense fan interest. Baseball has, for a variety of reasons, largely muted the differences between the American and National Leagues. Pervasive television and chronic interleague play gives the fans, casual or otherwise, far more opportunity to see stars pitted against each other than was once the case. The rosters are overloaded, and the managers are intent on getting as many players as possible into the game, thus limiting the exposure of the very best players. 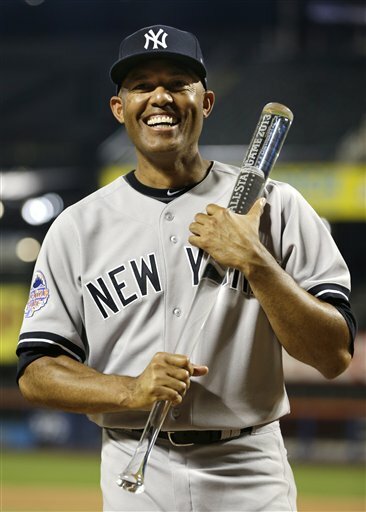 But the "midsummer classic" still retains its ability to please and thrill — as in Tuesday's welcome and farewell for the retiring Mariano Rivera. Moments like that will keep the All-Star game going for a long, long time. Glen Perkins didn't get to pitch Tuesday in the All-Star Game. Somehow, I think he's OK with that. "Hype" is too strong a term for the lead-in to the annual Futures Game, which is probably the most pure baseball, and thus least popular, event of All-Star week. (There were plenty of seats available at Citi Field, or so it appeared on the telecast). But there was a certain level of pre-game buzz for the prospect-laden exhibition, and that buzz was heavily focused on the Twins duo of Byron Buxton and Miguel Sano. The attention laden on those two — certainly among Twins fans, and in the industry as well — probably does qualify as hype. Buxton is now being touted as the brightest prospect in the minors, Sano as the best power hitter, they're in the same system ... They got a lot of the media attention in the week before the game, and they deserved it. It would not be surprising if Buxton and Sano were in the Futures Game next summer (in Target Field) as well. It's possible — and I hope this is the case — that either or both will make themselves ineligible by forcing their way to the majors, but reality is that Buxton right now is in high A ball and Sano is not getting a lot of hits in his initial foray into Double A. And neither got a hit Sunday either. Sano played the entire game at third base for the World team (and hit cleanup); he had, I would say, a good 0-for-2. He hit the ball hard for his outs (Buxton caught his final fly on the warning track in center) and drew a walk with a good selective plate appearance. He didn't get himself out. Buxton, on the other hand, was a mid-game substitute for Team USA (Billy Hamilton, a more advanced prospect, got the start ahead of him) and struck out in his two plate appearances. That they combined to go 0-for-4 Sunday is perhaps disappointing but no more significant than the fact that Kirby Puckett once went 0-for-4 in an All-Star game (1987). The Twins go into the All-Star break with a two-game winning streak. They will come out of the break on Friday with a drastically different outfield. The Twins optioned out three players after Sunday's win: outfielder Oswaldo Arcia, infielder Eduardo Escobar and first baseman/right fielder Chris Parmelee. Catcher/outfielder Chris Herrmann and infielder Doug Bernier were immediately named as call-ups; the third addition was not named, but is expected to be first baseman Chris Colabello, who is slated to play in the Triple A all-star game Wednesday. It has been said here since early in the offseason that 2013 doesn't matter. All decisions should be made with the future as the priority. A good case can be made for two of the demotions on that basis, not so much the third. Let's take the least important one first. Bernier, who has all of four major league at-bats, is a 33-year-old minor league veteran who is having, literally, his first good hitting season that didn't come in a notoriously good hitting environment. The only point to swapping out Escobar for him is giving the younger (24) Escobar a chance to play; he's had all of 13 at-bats this month. There is, to be blunt, no question worth asking about the future of the Twins to which Bernier is a useful answer. Escobar might be a utility infielder of the Al Newman/Nick Punto ilk down the road; right now, Ron Gardenhire isn't playing him, so he's not developing. Bernier can sit on the bench as well as Escobar can. The Arcia demotion brought immediate complaints on my Twitter feed, largely along the lines of: yeah, he's been awful for the past week, but so was Aaron Hicks for six weeks and they didn't send him down. True, but: Hicks, during his horrendous April, was doing other things to help the team. He drew a few walks; he played better defense in center field than anybody else available to them; he ran the bases well in those few times he was on base. Arcia in a slump does nothing to help; this is the outfielder, remember, who fielded a foul fly with his face last week. but he's played just 66 innings there this season. According to Baseball Info Systems's defensive metrics, Arcia is -17 in the plus-minus rating and -10 in runs saved. In contrast, Josh Willingham, widely recognized as a poor defensive outfielder, is -9 and -4 — in about 150 more innings. Arcia on Wednesday, Thursday and Friday came to the plate 14 times and struck out 11 times. Throughout that stretch of futility, Gardenhire spoke publicly about how Arcia was trying to "hit an eight-run homer;" certainly the youngster was talked to about it; and he kept overswinging. Arcia is a big part of the Twins' future. But he needs to do a better job of adjusting, and it may well be that he needs a reality check. For me, the demotion of Parmelee is the bigger disappointment. Certainly his offense hasn't been what one desires from a first baseman-right fielder, and he hasn't gotten better (one hit and 12 strikeouts in his past 22 at-bats). Considering how he dominated the International League last year, I don't know what he's going to learn from this demotion. I certainly would rather see Parmelee get at-bats in the majors than Clete Thomas. Parmelee may not turn out to be a regular on a contender; we know Thomas isn't. Presumably the Twins intend to bring both Arcia and Parmelee back soon. Until then, the corner outfield spots will likely be manned by some combination of Ryan Doumit, Thomas and Herrmann. I don't think this is an upgrade. When this photo came floating across my Twitter feed this week, I had to take it to colleague Pat Christman, who does most of The Free Press' sports photography. PC, I really want you to bring back a photo like this from the next MoonDogs game you shoot. Even if you lucked into just the right fraction of a second, none of the MoonDogs is Miguel Cabrera. This is a truly frightening image, to see a baseball flattened like that. 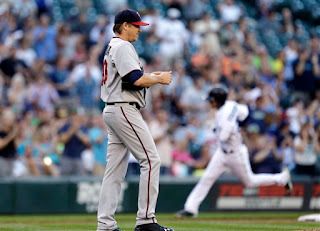 Another frustrating loss for the Twins — they outhit the Yankees Friday but couldn't plate any of their base runners. But here's a positive for the Twins: a very impressive throw from Aaron Hicks to gun down Vernon Wells trying for a triple. To be sure: If Hicks had cleanly played the carom off the wall, Wells probably doesn't try for third base. And when the ball got past Hicks, it so happened that Hicks, in retrieving the ball, had his momentum going in the direction of his throw. And he admitted to reporters after the game that he was trying to hit the cutoff man, not throw all the way to third base. The wet ball got away from him. Still — it was something to see. The throw had Jon Heyman of CBS Sports tweeting that Hicks has a "Top 3" outfielder arm. And it had me comparing Hicks' arm to that of the legendary Roberto Clemente. This is not a comparison I make lightly. Clemente probably had the greatest throwing arm of any outfielder in history. I found, as part of a much longer video on Clemente, footage of a throw he made during the 1971 World Series against the Baltimore Orioles: A fly ball that he tracked down headed toward the right field foul line, after which he stopped, spun and threw to third to nail an Oriole trying to advance. It was probably a shorter throw than Hicks' throw Friday night, but Clemente was working against his momentum. Nobody should doubt the quality of Hicks' throwing tool. 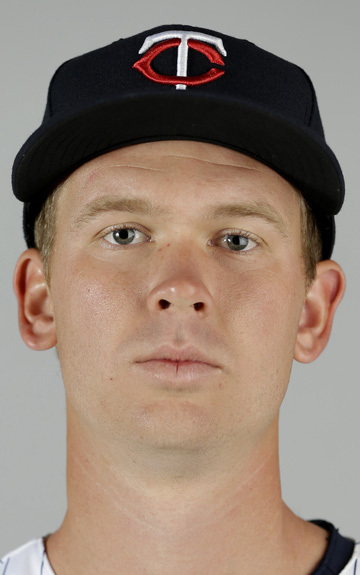 Michael Tonkin, who tore through the Twins farm system the past year-and-a-half, made his major league debut in fine fashion Thursday. He came in after Josh Roenicke laid an egg in the seventh inning to strike out Evan Longoria, then followed that with a perfect eighth inning. Tonkin is up right now because fellow rookie Caleb Thielbar is back in Minnesota for his grandmother's funeral. But when Tonkin was brought up, he was told he may stick. Thursday's outing certainly gives the Twins no reason to ship him back to Rochester. But if they keep Tonkin in the majors, somebody else has to go. The bullpen has been probably the strongest part of a weak team, but it's getting bedraggled from overwork. There's no real shortage of slumping relievers, but there is a shortage of relievers easily sent to the minors. Roenicke is an example. His ERA has risen from 2.81 after his appearance on June 19 to 3.76 now — nine appearances, 6.1 innings, six runs. For the season, Roenicke has struck out 25 — and walked 21, a lousy ratio. 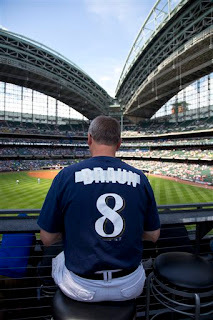 But Roenicke is out of options; as with P.J. Walters, he would have to clear waivers and removed from the 40-man roster to be sent to the minors. Ryan Pressly's ERA over the past 28 days is 6.39. But as a Rule 5 guy, he has roster restrictions — and at age 24, he has more of a future than the 30-year-old Roenicke. I'd hate to see the Twins give up on Pressly. Brian Duensing, who lost the job as lefty set-up man to Thielbar, has seen his ERA soar to 4.86. I'm not sure of his option status, but even if the Twins are at liberty to send him down, I don't know how eager they are to pay his $1.3 million salary to pitch at Rochester. The other guys in the bullpen — Glen Perkins, Jared Burton, Anthony Swarzak, Casey Fien, Theilbar — are not serious candidates to lose their jobs. 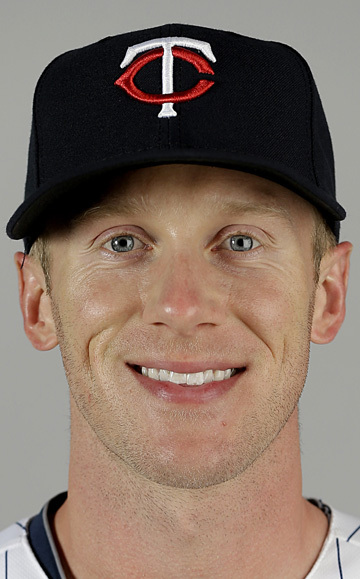 My conclusion: If Tonkin stays (and he probably should), the guy he should replace is Roenicke. Aaron Hicks got his batting average above the Mendoza Line this week. Wednesday night's 1-for-5 (with two strikeouts) performance left the rookie center fielder with a slash line of .203/.270/.369, which isn't good but is a darn sight better than the .042/.179/.042 he sported on the morning of April 21. Since then, he's gone 43-for-174, a batting average slightly under .250. His slash line entering Wednesday's game (Baseball Reference hadn't be updated as of this writing) since April 21 was .249/.301/.469. That is acceptable production for a 23-year-old center fielder, but it does not signal a leadoff hitter's skill set, which is what I expected to see. Hicks has drawn 20 walks so far; even accounting for the time lost to his hamstring pull last month, that's a good bit fewer than I would have expected, given his minor league track record. That track record, of course, is riddled with slow starts and repeated leagues. Hicks spent two full seasons in low-A ball, spluttered in high-A, had a slow start in Double A — and then jumped straight to the majors on the strength of a spectacular spring training and the lack of a realistic alternative. In retrospect, the jump was too much to ask of him. But he has improved in the major league crucible, and he's young enough to get better. He'll have to get better. A .249/.301/.469 center fielder with quality defense can play (and hit in the bottom half of the lineup); those same numbers won't do for a corner outfielder, and with Byron Buxton on his way, Hicks doesn't figure to be the Twins' long-term center fielder. He'll either play an outfield corner or move on to another team. 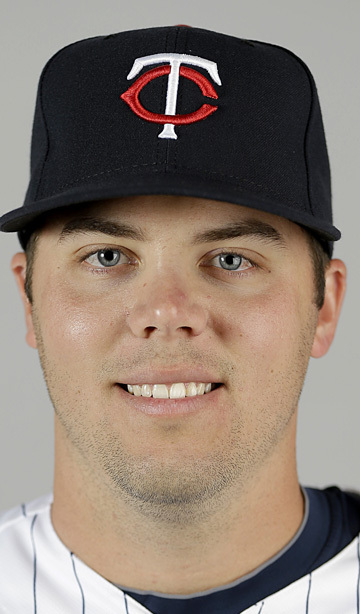 I can see Hicks developing into a .260 hitter with 20 homers, 20 steals and 80 walks; that can play in an outfield corner, especially paired with center-field quality defense. It wouldn't be a classic leadoff hitter's line, but it could fit there. Or, if Buxton is to be the leadoff man, it would definitely work in the lower half of the order. But Hicks isn't there yet. And maybe he'll never get there. His journey is one of the most important things to follow in the second half of the Twins season. Babe Herman was one of the off-beat characters who enliven baseball history. Herman — Floyd Caves Herman, to be precise — hit .324 during his 13-year major league career and once hit .393. He was an impressive hitter and a dismal outfielder whose exploits afield were legendary for their ineptness. Herman always resented claims that fly balls routinely bounced off his noggin, and supposedly once complained to a writer that he had never been hit in the head by a fly ball. "What about the shoulder?" the scribe asked. "Oh no," Herman said. "The shoulder don't count." The Herman story came to mind Tuesday night when Oswaldo Arcia apparently lost a foul fly in the lights and roof of Tropicana Field and played it off his face. Arcia is a talented young hitter who figures to be a big part of future Twins lineups, but it's fair to say that defense is not his strong suit. Baseball America on Monday released its midseason re-ranking of its top 50 prospects. This July's list has Byron Buxton at No. 1 and Miguel Sano at No. 3. A third Twins prospect, Alex Meyer, is No. 32. 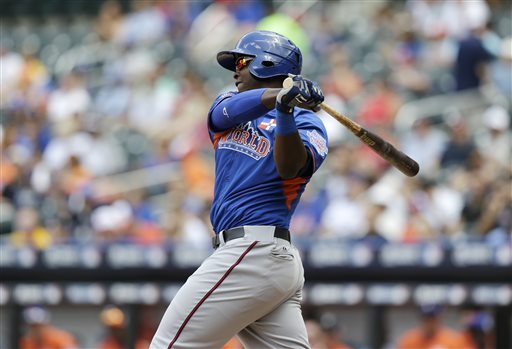 In its Top 100 list of February, BA had Sano at No. 9, Buxton 10 and Meyer at 59. Three others in its Top 100 — Oswaldo Arcia (41), Kyle Gibson (68) and Aaron Hicks (72) have graduated to the majors, and Arcia and Hicks have both had enough playing time in the bigs that they will never be on a BA prospects list again. Buxton and Sano have clearly moved up some because others ranked ahead of them have graduated to the majors — and also because they've established that they have greater skills than they had coming into 2013. There is no longer any serious doubt that Sano is going to play third base in the major leagues (whether he'll spend his career at the hot corner is another matter), and Buxton has demonstrated a more mature hitting approach than scouts anticipated. Meyer's rise on the chart comes as a greater surprise. His stats in Double A are certainly not horrible, but they aren't dominating, and he's been out of action for about a month now. (He's supposed to return to pitching in games in August.) I don't think he's really hurt his prospect status, but I don't see how he should be 27 spots higher. He was likely to make the Top 50 simply by attrition, however, so my argument is more a matter of placement. I would have thought Eddie Rosario — who, granted, didn't make the preseason Top 100 and thus had a ways to rise to make the midseason 50 — would have been a more likely Top 50 candidate. As with Sano, Rosario has largely answered the questions about his ability to handle second base defensively. And he has continued to hit. P.J. Walters, designated for assignment last week, cleared waivers and opted to remain in the Twins organization. It's the second time in less than a year that every other team passed on the opportunity to add Walters to their major league roster, and the second time that he decided that if he's going to be Triple A fodder, it may as well be in the Twins organization. Which may be the right decision for him. But if/when the Twins dip back into their farm system for a starter, Walters isn't likely to be the man they pull up. Vance Worley and Andrew Albers, to name two, are probably ahead of him right now. fifth inning on Sunday afternoon in Toronto. Scott Diamond had another poor start Sunday: 4.2 innings, six runs, three homers, four walks. Last season's rotation revelation has seen his ERA rise almost two full runs per game — 5.52 this year, 3.54 in 2012 — and he has now failed to get through six innings in five of his last six starts. It's not easy for me to be objective about Diamond, who I declared earlier this year to be MFT — "My Favorite Twin." I have a basic liking for this ilk of pitcher: a lefty who avoids walks and homers and lives on the groundball. I've had that fondness from the days of Geoff Zahn, who averaged more than 200 innings over a four-year period with the Twins in the late '70s and went 53-53 in that span — and did so with a strikeout rate lower even than Diamond's. Such pitchers are very team-dependent. They need infielders who can turn the double play, catchers who can help hold the running game in check (to keep the double play in order), outfielders who can cut off balls in the gap (to keep the double play in order). Diamond's season to date illustrates how thin the margin of success is for a low-strikeout pitcher. Diamond is walking 2.1 men per nine innings this year; a good rate, but a half-walk higher than in 2012. His strikeout rate is down from 4.7 K/9 to 4.3. His BABIP — batting average, balls in play (which takes out the home runs and the strikeouts) has risen 36 points, which suggests that year's defense behind him has been less effective. The home run rate has boomed from 0.9 HR/9 to 1.5, which is too high for any type of pitcher. Diamond last year was among the very best in the majors at getting ground balls, at getting double-plays, at avoiding walks. The things that pitchers with his skill set have to be good at, he was generally very good at. This year, for whatever reason, he isn't. And for him, that's the difference between success and failure. attending the "Bark in the Park" game in Miami. 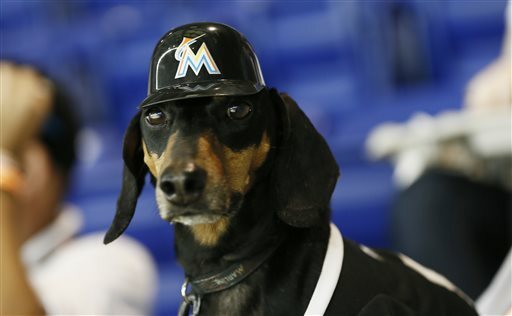 Obligatory joke at the Marlins' expense: Attendance in Miami has gone to the dogs. P.J. Walters, having been designated for assignment, is now in baseball limbo. He's not officially in the Twins organization, but if nobody claims him on waivers, he can be outrighted to Triple A. Considering that there's about half the season yet to play, the odds are that bunch will change. If Walters isn't a candidate to move back into the rotation, who is? Comment: Hernandez has made seven starts in the majors for the Twins (3-1, 5.54) and six for Rochester (2-2, 3.60). If he has a major league career ahead of him, it's probably as a relief pitcher. He'd be a safe place-holder, but that's all. Comment: The Minnesota native would have opened 2013 in the major league rotation but ran into arm issues. He's made nine starts in Rochester and has gone 3-4, 8.16, with just 19 strikeouts in 43 innings. Hard to see him being close to a callup. Comment: The Aussie opened with the big club and went down quickly. He dominated the International League last year but has fallen off this year (1-6, 5.05). His status isn't high. Comment: He's 5-3, 3.81 since his demotion, which looks pretty good compared to his fellow 40-man roster mates. But it comes with just 30 strikeouts in 52 innings. I do expect him to return to the major league rotation this year, but that's more because of what the Twins have invested in him than because he's earned it. Comment: Lefty from Canada, he was just named to the IL all-star team (8-3, 3.00 with 86 K in 99 innings). He's 27 and has spent more time in his career in relief than starting, but he's been a fixture in the Red Wings rotation and is having a fine season. I don't see him as a likely long-term rotation candidate. Comment: Another lefty, he has made one start for the Red Wings after a strong first half with Double A New Britain (6-6, 2.61). He's 24, and this is by far his best minor league performance. Probably behind Albers in terms of getting a chance. Comment: He makes the list only because he's getting $5.5 million this year, which I believe makes him the Twins' highest-paid pitcher. He's gotta do something in the minors before the Twins will consider letting him try to earn some of his pay in the majors, and I don't think it's real likely. 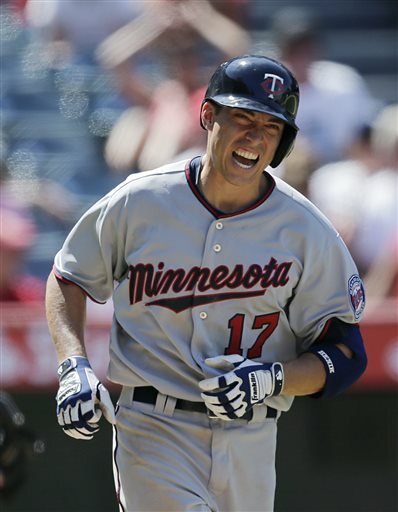 No future benefit from his return; the Twins won't exercise his $8 million option for 2014. Comment: Some good signs from May as he repeats Double A (6-5, 3.98 with 93 K in 95 innings). The control is improving, although his season walk rate (3.9 BB/9) is still too high. He might be a September callup, since he's already on the 40, but he's not going to be yo-yo'd up and down. Expect patience with him. pitch Wednesday against the New York Yankees. P.J. Walters designated for assignment: Mike Pelfrey is coming off the disabled list to make Saturday's start. The Twitter buzz from the beat writers this week suggested that both Walters and Scott Diamond were pitching for their jobs in the Yankees series. Diamond went 6.2 innings, allowing three runs (two earned); he also had, according to Baseball reference, more groundballs than fly balls for the first time in four starts. Diamond lives on the grounders, and his GB rate this year is closer to average that top-of-the-charts, as it was last year. For his part, Walters went five innings, allowing three runs, all earned. And it was Walters who lost his job. Which, if it was indeed down to Diamond vs. Walters, the right choice. Neither man is gifted with overwhelming stuff, but Diamond has more markers in his favor (not the least of which is being left-handed). Walters is out of options, and Diamond is not, but the call apparently wasn't close enough for that tow sway the decision. So now Walters enters the 10-day limbo of DFA and waits to see what happens. Duensing, Burton slide down the bullpen hierarchy: The Twins eight-man bullpen has had two castes this season: The four late-and-close guys (closer Glen Perkins, set-up man Jared Burton, and middle men Casey Fien and Brian Duensing, who are generally used for fractional innings to get out of jams in the sixth and seventh), and the four longer men (Josh Roenicke, Anthony Swarzak and rookies Ryan Pressly and Caleb Thielbar). Burton had a rough June (ERA 7.45 for the month) and he opened the new month by giving up three runs in one-third of an inning in Game 1 of the Yankees series. So now Fien is supposedly going to be the eighth-inning guy while Burton works in lower-leverage situations. It's less clear who gets the ball in Fien's customary role, which isn't exactly low-leverage. The Twins like a power arm in that job, and I would think that points to Pressly. But (a) they might prefer to give the veteran Roenicke the first shot and (b) Pressly hasn't been all that effective of late either. Ideally Burton straightens things out quickly and reclaims the eighth-inning role. Fien may be just as good in that role as Burton, but the options for Fien's accustomed role are thin. Similarly, Thielbar has supplanted Duensing in the left-handed set-up role. 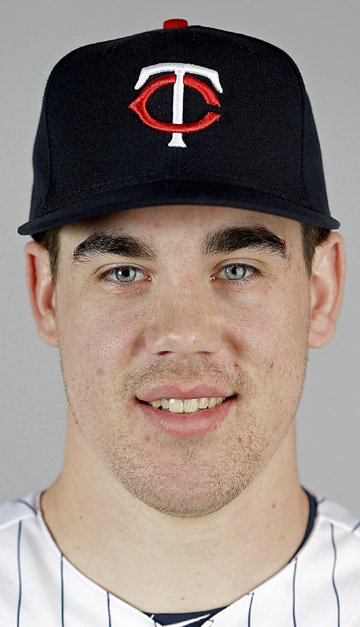 Duensing, who has been death on left-handed hitters for most of his career, has not been nearly as effective this year (.292 batting average allowed to lefties). Thielbar hasn't been charged with an earned run yet in the majors (18.2 innings), although he has allowed some inherited runners to score. Nor, through 16 games, has he ever been brought in with a lead. So far, Ron Gardenhire has used Thielbar much as he used Craig Breslow in 2008. Dennys Reyes was Gardy's primary LOOGY (Left-handed One-Out GuY), and the manager wouldn't use Breslow in game situations. Pigeonholing Breslow into low-leverage situations only was one reason the Twins didn't win the divisional title that year. The Twins aren't winning the division this year no matter how Thielbar is used. But maybe a lesson has been learned. I would think that those figures suggest more that Yankee fans in Minnesota -- and they're out there -- don't care about their team, but never mind that. A greater point is that in this new age of "dynamic pricing," attendance -- or, more precisely, tickets sold, since that's what is announced -- is not a particularly good measure of fan interest. Pull out your handy-dandy Twins pocket schedule and examine the seating chart. Note the lack of specific prices. The Twins have not only a bewildering number of section classifications in Target Field, they have five different classifications for games. The Friday-Saturday games last month against Detroit were listed as "elite" games; the Sunday game of that same series was a "premium" game; when Detroit comes to Minnesota for a weekday series in the last week of the season, those games will be "extra value" games, and the tickets will be considerably lower priced. The result that the same seat is priced differently for different games. And the point of dynamic pricing isn't to maximize ticket sales; it's to maximize income. These are not the same. Let me illustrate with some made-up numbers -- made up because (a) I'm not privy to the real numbers and (b) I want to keep this easy to follow. Imagine a section of 1,000 tickets. If you price them at $10 apiece, you can sell them all for each game, $10,000. Price them at $100, you only have to sell 100 of them to get that same $10,000. Sell 500 of them at that price, you get $50,000 -- and Pat Ruesse sees empty seats. But I don't know that for a fact. It's possible that the extra charge levied for these "elite" games against the Yankees more than made up for the fact that about a third of the tickets went unsold. I do suspect that after a few years of dynamic pricing, the Twins will have sufficiently refined the algorithm to find the sweetest spot of revenue. That's their goal, remember. Not butts in seats, but money in the wallet. Josh Willingham went on the disabled list Tuesday with a torn meniscus and a bone bruise in his knee. 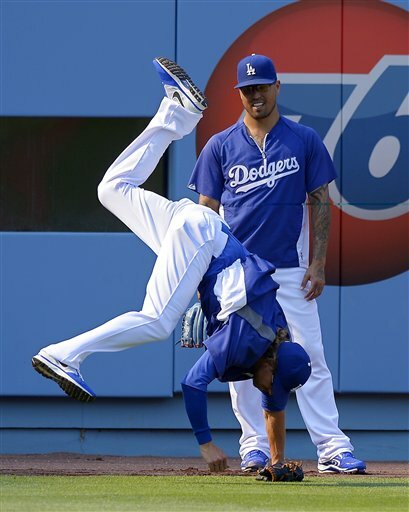 The problem really began, methinks, when he tried to steal second (on his own) in April and executed an awkward slide. A bum knee goes a long way toward explaining his statistical downturn this season. Apparently he had hopes of returning soon after the 15 days, but after Tuesday's game it was announced that he will have the knee scoped.. It's now unlikely that there will be an trade market for Willingham this month. Not that one should have expected much of one anyway. He's a 34-year-old low-average slugger with limited defensive value (if any); I don't think he'd have fetched a prime pitching prospect even if he were duplicating last season's numbers. Aaron Hicks was reinstated from the disabled list to fill Willingham's roster spot. Terry Ryan had been saying that Hicks had to produce on his rehab assignment to return to the majors, and Hicks hadn't. But here he is again anyway. Hicks started Tuesday's game (and had a couple of hits), with Clete Thomas taking a seat. It bears watching how Ron Gardenhire handles this situation. Thomas has been more productive than Hicks, but Hicks is a more significant piece of the puzzle and needs to play. If Gardy would rather play Thomas, Hicks should be returned to the minors. It's been a odd, frustrating season for Parmelee. He's been better defensively in right than anticipated, and he's pretty consistently going deep into at-bats. Both are pluses. But at least until the past week or so, he's come up empty too often in those at-bats. I believe that process leads to results, and based on that theory, I still have hopes for Parmelee. I don't want to see the Twins give up on him too soon. Jared Burton, Ron Gardenhire's first choice for eighth innings, had another poor performance Monday night. He entered with a 4-3 lead, faced four batters, surrendered three hits and was charged with three runs and his sixth loss of the season. He didn't walk anybody, but a quick look at his statistics suggests that control, or lack of same, is a significant part of his problem. Last year, in 62 innings, Burton walked 16 men; he's already walked that many this season, in 35.2 innings. It should be noted that his walk rate this year (4 BB/9 innings) is about what he had for his career other than 2012, suggesting that last year was a bit of a fluke. Burton was very good in April and May, but June was not kind to him (7.45 ERA) and obviously July is off to a bad start. Which raises the question: If it's time to switch to somebody else for the main setup role, who would it be? Burton himself has been worked at a harder pace this year than last, and he's not the only hard-used reliever in the Minnesota bullpen. Five Twins are among the top 40 in the league in relief innings, with Anthony Swarzak leading the list with 52.2 innings. Rookie Ryan Pressly, who I think will eventually take a significant late inning role, is perhaps showing some signs of wear; he's given up runs in each of his last four outings, and his ERA has more than doubled during that stretch. Too many bad starts, too many bullpen innings. It's not a good recipe. The news Sunday that Matt Guerrier had been designated for assignment by the Los Angeles Dodgers prompted me to visit his Baseball Reference page to review his career. 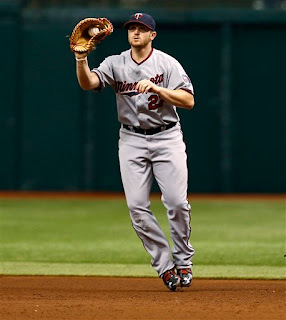 He had a nice run with the Twins, starting out as the long man/mop up guy and working his way into a key set-up role. He had five straight seasons (one with the Dodgers) in which he made at least 70 appearances, and he twice led the league while with the Twins in games pitched. All that work — plus the fact that he's in his mid-30s now — probably took a toll on his arm. Guerrier spent most of 2012 on the Dodgers' disabled list, and while he was back on a 70-games-pitched pace this year, he wasn't effective (a 4.80 ERA doesn't cut it anywhere, but particularly in pitcher-friendly Chavez Ravine). And so the Dodgers — in last place in the NL West but only four games out of first — decided to eat the remaining $2 million or so of his contract and move on. It's possible that Guerrier will land somewhere once he's cleared waivers and been given his release; he has a track record, and the Dodgers will be on the hook for the $2 million. But it won't be in Minnesota. The Twins don't have a bullpen problem (even if the relief crew got torched Sunday by the Royals), and even if they had an opening, they have younger and presumably more talented options in their minor league system to go to first.